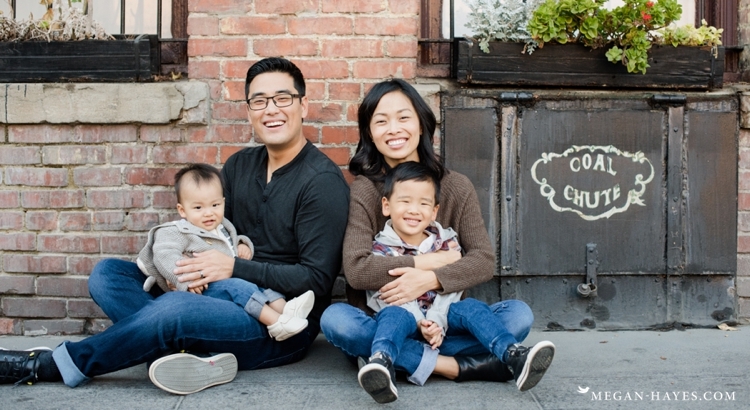 I so enjoyed seeing the Kay family again for their family session in Old Town Pasadena. Last time I photographed this family Gina was still pregnant with their youngest. It’s so neat to see little ones grow. Their two boys are just the sweetest and cutest little things! The little alley way was the perfect spot for their mini session. There was a little garden area next to a building with that cool tall gate you see at the beginning of their session. Like most of Old Town Pasadena there was lots of brick and probably my favorite thing was the old coal chute. I didn’t even see it there until Terry pointed out how much he liked it. I love anything with a bit of history behind it. It makes me imagine the old days and how there was so much more manual labor involved with day to day responsibilities. Towards the end of their session we made sure to grab a few shots of just Terry & Gina. I always encourage parents to do that during their family session. So often life gets busy and everything tends to revolve around the kids so it’s nice to get a good portrait of just mom and dad. Terry and Gina were kind enough to offer to watch Ellie for us while we had a little dinner date. I can’t tell you how nice it was to have an uninterrupted dinner. Usually Ellie is a little fussy in the evenings when she is at home but she loves being out and about walking so she loved it too. They took her with them while they got ice cream for their boys and said that she was such a good girl. Eric and I enjoyed a burger at Slater’s 50/50 and then stopped and got some gelato. Thank you Terry & Gina! !